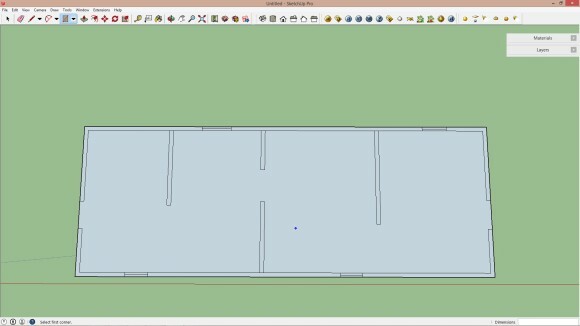 In this beginner tutorial we want to give you an insight how to create quickly a sectional drawing in Sketchup for your next and add some visual elements for e.g. a architecture presentation. We use a quite simple model here and go quickly through the steps to give you an idea about the general workflow. 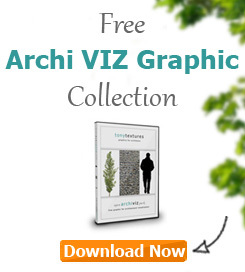 We also use and link to various of our free archi-viz graphics so do not miss to get through the steps and grow your own library of graphics for architecture visualization on the side 🙂 Enjoy! The beauty of architecture lies in three-dimensionality. A plan may excite an architect but not always the client. 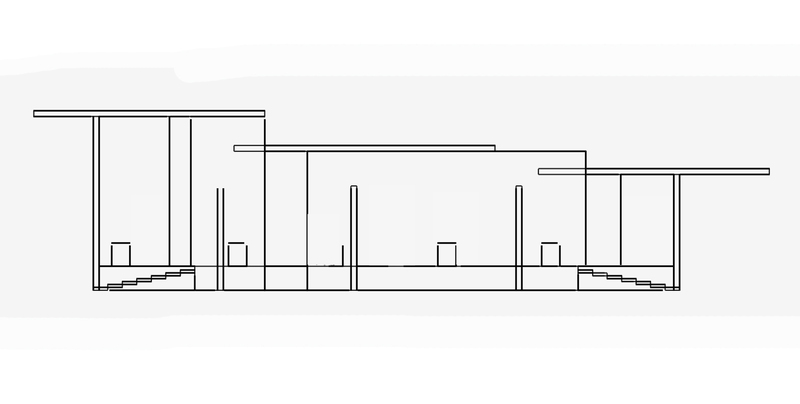 A two-dimensional representation of sectional drawing has a chance to be misinterpreted. 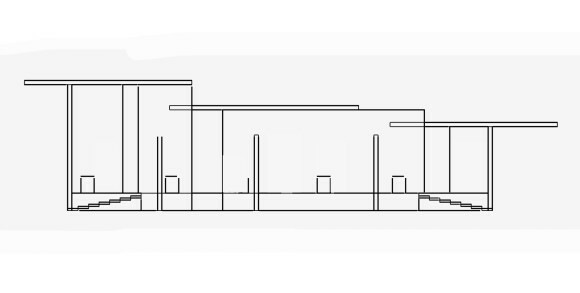 The greatest architectural firms on earth always emphasize on the simplicity and elegance of presentation drawings as the clients want the end product, not the raw ones. In student life, architects get much less time to create fabulous graphics. A calculative approach of time-budgeting and the knowledge of effective shortcuts is the only key to click the aesthetic-cravings of the judges. It’s beneficial for the practicing architects too, as sometimes, clients want very quick visualizations. So here is my cheat-sheet of creating a quick yet artistic sectional drawing in a real short time. 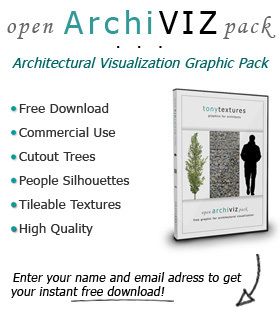 For this tutorial we also use the free textures from our Open ArchiVIZ Pack and other tonytextures ressources that are linked in the text. Grab the stuff for free for your next architecture visualization project or for this tutorial! 2) Now extrude it accordingly to create your model. 3) Always remember to GROUP the objects. Select a style which contains simpler lines. I’ve used Straight Line 04 Px here, but you should explore a lot to get the one you love! It will be initial cutout. However, you can move the plane by selecting it with Move tool to penetrate through a deeper section. Click the view you want. (Front, rear, up or down; from where the generated section is visible. Now you’ll get a shot of your section. Just keep in mind to zoom in for a maximum visualization. Here, we’ve actually got the basic section drawing to work on. Let’s proceed with Adobe Photoshop to quickly add some graphics and a background image. Now it’s time to give it a greater shot. 2) Delete its background using Magic Eraser tool. Simply click on the white background with the eraser. Customize it as per your specifications. I’ve chosen an A4 paper from the international paper option and selected a resolution of 300 pixels/inch. Choose CMYK color setting if you want better printing. Now import the drawing on your awaiting canvas through File<Place Don’t resize it, the original one is a better fit for this high resolution. Next we want to select and fill some general areas like the ground. At first, you need to mark the chopped ground-line. Work with the Rectangular Marquee tool, select the area beneath your section. Add a new layer. Rename it for your reference. Now fill out the rest of the cutout walls and floor planes. You have two alternatives. Select the basic sectional drawing layer, use the Magic Wand Tool on the cut area and see the magic. Repeat filling. Use the Rectangular Marquee Tool and draw the cuts, basically, repeat no. 3. Don’t forget to create a new layer for each fill. It leaves a flexibility to edit afterward without any major change in the drawing. Select the repetitive layers all together and convert to smart object. You can copy it as a singular object from now on. Next I want to add some 2D trees in my section view. I often like to use hand-drawn trees as they have a special look. 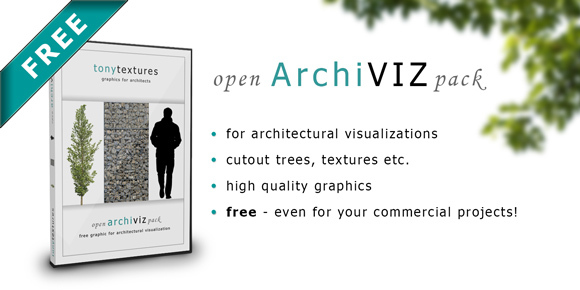 You can find some hand-drawn PNG trees without background in our Open ArchiVIZ Pack. The pack is absolutely free and can be used for private AND commercial! For the trees to be seen from the windows, place it over the window punch. Right click and select inverse. Now go back to the tree layer and erase the unexpected twigs and trunks. Simple! Add trees to the surrounding too. Work on the opacity and sizes. The trees in the front are sharper and bigger while those overcrowding the background tend to be shorter, less visible. Many trees with varied opacity create three-dimensional visual pleasure. Select a window from the basic section drawing layer by Magic Wand. Then create a new layer. Name it “window 1“. Select Brush tool, choose a brush. I prefer brush no. 100 in a size of 133 px. Select the color. For colored section, I like any lighter shade of cyan. Now, sketch the texture. It will be a lot easier if you work in a graphic pad but trust me, even a little bit of practice makes your mouse-hand perfect, too. Do the waters in the same Just add strokes of other colors to give a greater depth. Precaution: don’t overdo the strokes for the glass. Keep it simple. Create a new layer. Keep it under all the layers. Open the sky background image. Play around with the scaling and location – so which part of the image is visible in your canvas. I reduced saturation and increased brightness a bit. Sketch the shadows using the brush tool. Keep the areas near the openings light and stroke down the darker ones. Work in multiple shades of gray. Keep each room in each layer. It will help a lot in future. Create hierarchy. Play with the opacity and sizes. Usually, total opaque human figures break the attention over unnecessary details. Keep the opacity medium to low in order to focus on the designed spaces. Now, your sectional drawing it totally ready to convince everyone! Does it look like a tedious line drawing? Surely not. The more you practice; the quality of your brushstrokes will improve and take a lot less time. As mentioned we used a quite simple design here to go with you through the steps but we hope that you can use the workflow ideas to create an awsesome architectural section in your next project within a limited time frame as well! So from now on you don’t produce building sections, create artworks!